West Indies batsman Chris Gayle has been called "disrespectful" for asking an Australian journalist on a date in a Big Bash League pitch-side interview. Gayle was responding to a question from Ten Sport's Melanie McLaughlin about his aggressive batting style after scoring 41 runs in 15 deliveries. He said: "To see your eyes for the first time is nice. Hopefully we can have a drink afterwards. Don't blush." A BBL statement said the comments were "disrespectful and inappropriate". 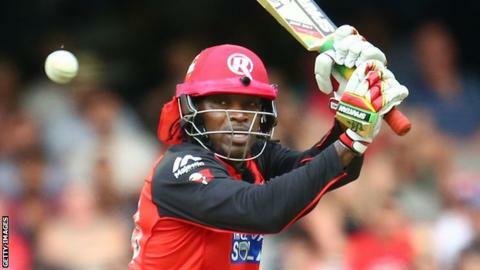 The 36-year-old former West Indies captain's knock helped the Melbourne Renegades to a five-wicket win over Hobart Hurricanes. BBL head Anthony Everard added: "We'll certainly be talking to him and the Renegades about it. "This league is all about its appeal to kids, families and females. There's just no place in the BBL, or for that matter cricket anywhere, for that sort of behaviour." Australian broadcaster Ten Sport apologised on air after the interview and later tweeted "well played for staying professional" after McLaughlin replied to Gayle: "I'm not blushing." McLaughlin, 36, joined Network Ten to host match-day coverage of the Big Bash League in 2013.